Science Olympiad is a team-based competitive club that meets on Thursdays. Students learn, build and perform a variety of activities. Power of the Pen provides students with a chance to build on their love of creative writing. Students meet Wednesdays to participate in weekly writing prompts, activities, critiques and ideas. Math Counts is meeting again, every Tuesday after school in Mr. Knostman’s room! This academic club gives grades 6-8 students the opportunity to explore challenging, real world math problems, while having fun with their peers. 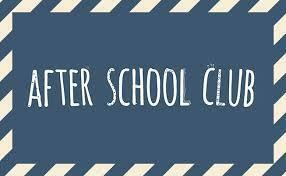 Any and all middle school students are welcome to come any Tuesday they have available after school. Those that attend 50% of this year’s meetings, will earn a pizza party at the end of the year! National Geography Club meets on Mondays and they enjoy learning about other countries, cultures and physical features of Earth. They compete with each other and students around the U.S. using an online quiz program.